Legendary German defender and captain. Dietz started to play as striker but most time spent on left back position and later moving on to play as libero. He was very good scorer despite playing in defence, always had good scoring instinct to move in the right space and score a goal, especially after set pieces thanks to solid heading abilities. But he also had good shot and could score effective with his foot. His main stregth was his working habit with lot of fighting, running and sliding, he was very good tackler with good pace. His home club is the SVA-Bockum Hoevel, whose honor he is a member. For this club, he played in the national league Westphalia. After he scored 19 goals in ten games in 1969 when he was only for a trial first FC Cologne and then ordered a trial with MSV Duisburg, who took him under contract in 1970. In 1970, Dietz had been invited to a test match of the German amateur team against Austria, while he was only a substitute player. For the 1972 Summer Olympics as a player he was made the national team of amateurs, but then decided for immediate career start at MSV Duisburg. He played as a defender from 1970 to 1982 for MSV Duisburg and from 1982 to 1987 for FC Schalke 04 in the Bundesliga. In 495 missions, he scored 77 goals, 70 for the MSV and 7 for Schalke 04 On 5 November 1977 when he scored against Bayern Munich 6-3 MSV his four goals against the former national goalkeeper Sepp Maier. Until today he is the second best scorer of the Bundesliga MSV. Throughout his career he won the Bundesliga in less than 11 yellow cards, he was never sent off. His greatest success was in the club reaching the final of the DFB-Cup 1975, which lost 0-1 against the MSV with Eintracht Frankfurt. In the German national team, he was active from 1974 1981 in 53 games and took part in the World Cup 1978th As captain he led the national team at the European Championship title in 1980. Previously he was at Euro 1976 with Germany Vice-European champion. On 19 May 1981 in Stuttgart against Brazil he was used the last time the national team. For alleged improper remarks in an interview, he told the Germany coach Jupp Derwall in writing, to be disappointed in him. On 10 May 1988 he took before 25 000 spectators at the Duisburg Wedaustadion retired from his active career. On that final game was attended by many prominent footballers, including Uwe Seeler, Gerd Müller and Petar Radenkovic. After his playing days he worked from 1987 to 1992 as coach at ASC Schoppingen, 1992 to 1994 then the third division side SC Verl, later in the youth field at VfL Bochum, where he helped out twice as interim coach of the senior team. He then moved back to the MSV Duisburg, where he oversaw the amateur side of the "Zebras" and brought in an advisory role in the management of the association. Even Bernard Dietz was here as caretaker coach of the professional team in the second Bundesliga in use. 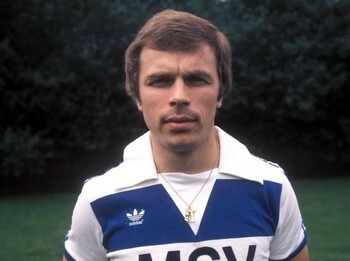 Through his down to earth kind of Bernard Dietz is with the fans in the whole Ruhr area still very popular and as a role model in particular, at MSV Duisburg highly regarded. As a special appreciation of the fans of the MSV christened in August 2005, their mascot to the name "Ennatz". In addition, the club was appreciative of the fans in his time as "MSV Dietz castle" means. On 14 May 2006 Bernard Dietz became the new coach of the football division side Rot Weiss Ahlen. On 29 Dietz said his resignation in October 2006, after the team had not won four games in a row and had slipped in the table continues. In support of Dietz said he no longer reach the players. At the same time, he said that was his last Ahlen coach station and that he would retire. Bernard Dietz founded in September 2007 together with his son Christian, the "football school, Bernard Dietz." In cooperation with his friend Ludger Wilking Hoff Dietz provides funding training for children between six and 14 years. Bases his school are Duisburg, Werne, Hoetmar, betting rings and Dortmund. Dietz came in late September 2010 the function will return as a "consultant and representative" to MSV Duisburg. At the start of the 2010/11 season he was honored as a legend of the MSV.